"These delicious sloppy joes will make a mess on your face, not in your slow cooker!" In a skillet, cook beef over medium heat until brown, stirring to break meat in pieces. Drain fat. Line a 5- to 6-quart slow cooker with a Reynolds(R) Slow Cooker Liner. Open slow cooker liner and place it inside a slow cooker bowl. Fit liner snugly against the bottom and sides of bowl; pull top of liner over rim of bowl. Combine beef and remaining ingredients (excluding kaiser rolls) in the slow cooker. Cover; cook on high-heat setting 4 to 5 hours or low-heat setting 8 to 10 hours. Carefully remove lid to allow steam to escape. 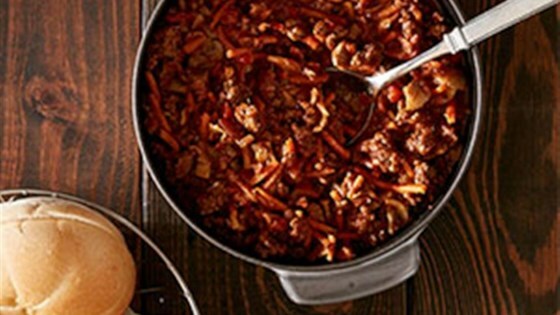 Serve sloppy joes right out of your slow cooker, spooning meat onto each kaiser roll. Do not lift or transport liner with food inside. Cool slow cooker completely, spoon out any excess liquid, remove liner and toss. For mess-free and scrub-free meals, use Reynolds® Slow Cooker Liners!